New York—Pace Gallery is pleased to present a solo exhibition of abstract works by the American artist Mark Tobey (1890 – 1976), the first show dedicated to the artist in New York in over twenty years. 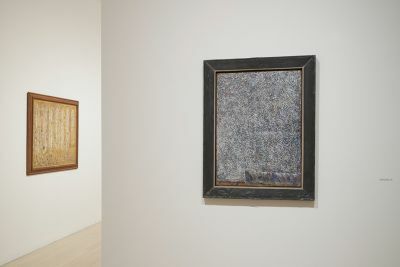 Bringing together approximately 35 paintings and works on paper from private collections as well as major international museums, such as the Fondation Beyeler, Hirshhorn Museum and Sculpture Garden, The Metropolitan Museum of Art, and the Whitney Museum of American Art, among others, the exhibition spans three decades of Tobey’s evolving approach to abstraction. The exhibition will be on view at 32 East 57th Street from October 25, 2018 through January 12, 2019, with an opening reception held on Wednesday, October 24, from 6 – 8 p.m. Pace will publish a full-color catalogue for the exhibition, which will include a new essay on Tobey by art critic Robert C. Morgan. The exhibition will also include the film Mark Tobey (1952) directed Robert Gardner and written by Gardner and Tobey. Filmed when the artist lived in Seattle, the film also features piano and flute compositions by Tobey and presents an experimental portrait of him as both performer and subject. While a contemporary of the Abstract Expressionists, Tobey developed a unique and often calligraphic style, grounded in a place of mindfulness rather than the physical action of his contemporaries. A spiritual and artistic turning point for Tobey occurred in 1918 when he was introduced to the ecumenical Baha’i Faith, which promotes universal consciousness. Working largely in water-based media, such as tempera and gouache, on modestly-scaled canvases and paper, Tobey began a painting by emptying his mind of extraneous thoughts in order to focus exclusively on the meticulous placement of abstract gestures and shapes. Within his tablet-size paintings, suffused with masses of lines and overlaid with fragmentary forms, Tobey captured universes of possibilities and energy. In discussing his practice, Tobey said: “I believe that painting should come through the avenues of meditation rather than the canals of action. Only then can one have a conversation with a painting. If I find no content, there’s no communication." Tobey’s all-over compositions, symbol-like marks, and calligraphic renderings emerged from a combination of Eastern and Western visual histories and points of inspiration, from Chinese scroll painting to European cubism. The artist led a largely nomadic life, spending early time in New York and Seattle and traveling to Hong Kong, Shanghai, Kyoto, and across Europe. Removed from any particular geographic or stylistic “school”, Tobey maintained a relentless focus on working on a small scale and discovered highly personalized ways to integrate the intricate rhythms and ideographic gestures he found in Eastern calligraphy with his practice of observing the world in rapt attention, and in doing so developed his all-over abstractions. As demonstrated in the three decades of work presented in the exhibition, these broad influences all contributed to the distinct visual language that Tobey evolved throughout his career. One of the best known and internationally respected American artists of the 1950s and 60s, Tobey’s contributions to abstraction and midcentury modernism have only recently begun to be fully recognized. In 2017, the Addison Gallery of American Art organized the first retrospective of Tobey in the U.S. in 40 years, which was also presented at the Peggy Guggenheim Collection in Venice during the 2017 Venice Biennale. Pace’s exhibition, the first comprehensive show of the artist’s work in New York in over two decades, continues to shine a light on Tobey’s groundbreaking style and lasting impact on international modern and contemporary art.